Don’t despair that this recipe takes 30 minutes; it’s practically a meal in one dish. Just add a simple grain, like brown basmati rice, quinoa or whole grain pita wedges. Then, over the next five days, enjoy the inspiration and jump start you get from all the leftover bits and pieces. The next post offers ideas for 5 days of spinoff meals. Measure cumin into a small frying pan over medium-low heat and spread into a fairly thin layer. Cook until cumin smells toasty, about 2 to 3 minutes, stirring occasionally and watching closely to prevent burning. While cumin toasts, combine remaining dressing ingredients in the cup of immersion blender. Add toasted cumin and process 10 to 15 seconds to combine well. Reserve for at least 10 to 15 minutes for flavors to meld. 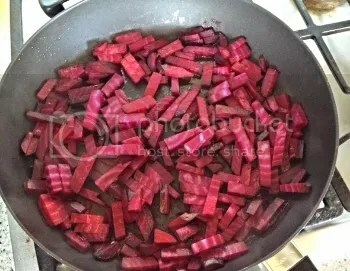 A very heavy-bottomed pan is needed to fully cook the beets until brown and flavorful without burning. Here are the beets at the outset. 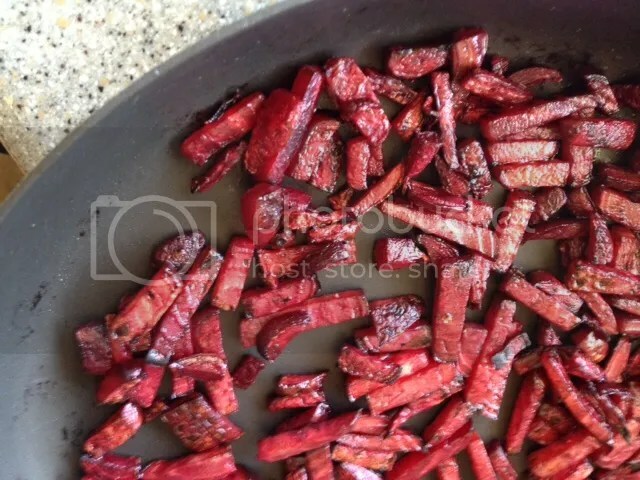 In a large, heavy bottomed sauté pan, sauté beets over medium high heat in first tablespoon olive oil, sprinkling with salt and pepper as beets cook. When lightly browned, turn heat to medium low and continue cooking until tender to taste, stirring occasionally to prevent burning (and adding 1-2 Tbsp. of water and covering if necessary to cook beets through.) When done, remove to a serving bowl to cool to room temperature. 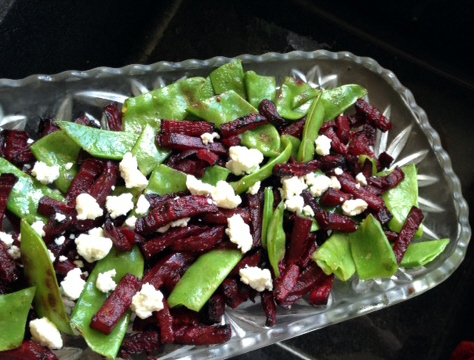 Here are the beets fully sauteed. They are reduced to about half the volume. With their sugars condensed, they make a sweet addition to the salad. Rinse pan, then sauté peas over medium high heat in second tablespoon olive oil until lightly browned, sprinkling with salt and pepper as beets cook. Remove to serving bowl with beets. Toss vegetables with half the dressing and allow to sit for 5-10 minutes, while preparing steak strips. Once done, remove steak immediately to a cutting board and slice into strips roughly ½” x 2”. Sprinkle steak strips, lime juice and cilantro over vegetables and toss lightly to combine. Taste and add salt, pepper, lime juice, cilantro and more dressing to taste. Serve with additional cilantro, lime wedges and dressing on the side. *Buying Note: Young, freshly picked beets are best for sautéing. One indication of freshness: beets sold as they are at farmers’ markets—still attached to tops that are vibrant and deep green; easy to find in summer and fall, since beets are then in season.